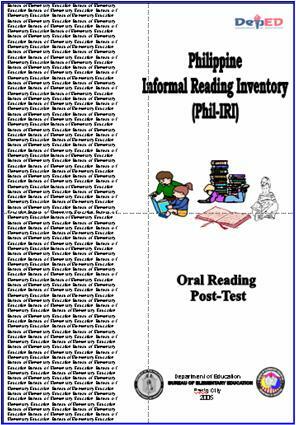 Under the ECARP (Every Child A Reader Program), the Philippine Reading Inventory (Phil. IRI – Oral Reading) was finalized in a workshop and distributed to all regions and divisions for field administration. A policy on the administration of the Phil. IRI in all elementary schools was directed through DepEd Memorandum No. 324, 2004 Administration of the Philippine Informal Reading Inventory.” Orientation on the administration of the Phil-IRI on the basis of the manual was the responsibility of regions and divisions. Results of the pretest will be bases for implementing interventions to address children who are reading below their level. Two hundred (200) sets of the Phil. IRI (oral reading-Pretest) consisting of: 1) Manual for Administration, 2) Teacher’s copy of the Phil-IRI, Assessment Tools for pupils, and 3) Forms for reporting pupils reading level from the school and to division, region and national level were produced and distributed. Another set of the Phil. IRI for the post-test is being edited for production and distribution next year. For Pupils, the Readers for Grade I in six pamphlets were finalized and now for printing, as well as the eight reading packages. 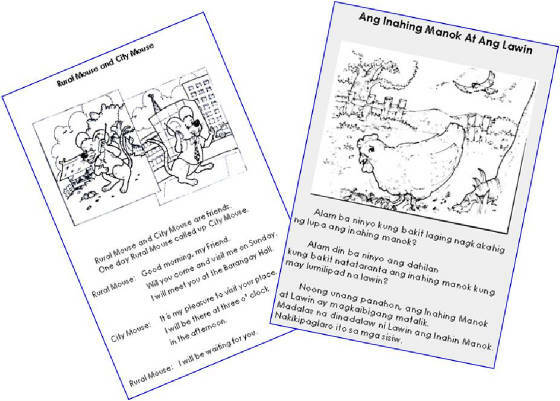 Readers for Grade II Volumes 1 and 2 (English and Filipino) were developed and now for finalization.